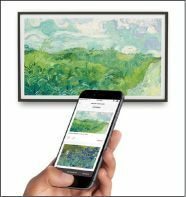 If your art collection has outgrown your wall space, closet those canvases and install the Depict Frame, a 49-inch screen fashioned like a framed painting. Though it’s not the first digital canvas—Samsung’s Frame TV also displays art—the image here is superior. Colorcalibrated and coated with a matte finish, the 4K UHD screen is optimized for displaying fine art in sharp detail. Using an app, you can cycle through images in Depict’s collection, to which new pieces are added each month. For $20 a month, you can upload your own works, and that subscription also grants access to a curated collection of thousands of paintings.